Curtis Duncan: The Pill Causes Multi-Generational Breast Cancer?? The Pill Causes Multi-Generational Breast Cancer?? Breast cancer rates have exploded in the past several decades with 1 and 8 women projected to develop the disease during their lifetime. When scientists and medical doctors love to blame genes on the disease, breast cancer is not caused by genes. It is caused by epigenetics which means under the gene. The science of epigenetics explains how genes are expressed because genes themselves do not change. Our genes can express in ways that promote disease and bad health and they cause express in ways that promote well-being and good health. What determines how our genes are expressed? Our environment, stress, diet, life experiences, and chemicals. When it comes to breast cancer, this disease is caused by estrogen and the early exposure to estrogenic chemicals create epigenetic changes that causes multi-generational cancer and health problems. This means that the early exposure in the womb to estrogenic chemicals or synthetic estrogens like the birth control pill create epigenetic changes which is based onto future generations which can cause a mother, daughter, granddaughter, and great granddaughter to all develop breast cancer. These epigenetic changes that occur as a result of exposure to chemicals are inherited by future generations. These epigenetic changes that have occurred in women as result of being exposed to the birth control pill are definitely one of the reasons for the explosion in breast cancer. The birth control pill is not the only synthetic estrogen which was shown to have multi-generational effects. A synthetic estrogen known as DES which was an FDA approved drug given to women to prevent miscarriage has also been proven to cause multi-generational breast cancer, birth defects, and health problems in women. DES was later banned after it was shown to be extremely toxic but the story of DES proves that power of early exposure to environmental and synthetic estrogens and its long lasting effects. Is the pill found in your drinking water? The pill is one of the top drinking water contaminants in the US and that is why it is so dangerous. When women take the pill, 80 percent of the estrogen ends up in the drinking water where it is not filtered by traditional filtration methods. The estrogen found in the pill does not readily degrade either and tends to remain the environment and soil for a long time. When pregnant women consume this water, then the female fetus will be exposed to this estrogen, the epigenetic changes will occur, and the female fetus will develop breast cancer later on in life along with future generations. The massive cost to clean up the massive pollution of the water supply caused by the birth control pill has been estimated to cost $30 billion in England alone! Consuming public drinking water is also a major cause of breast cancer and it is loaded with synthetic estrogens and pesticides like the birth control pill which cause breast cancer. My recording, Harmed By Hormones: How Estrogenic Chemicals Harm Women's Health, tells you how to filter out all the hidden estrogens in drinking water. Is the pill found in your food? A large portion of food grown in America is actually made with toxic sewage sludge. Sewage sludge is what is left over when the government treats all the raw sewage. Sewage sludge is really toxic waste which should be disposed of but the government sells it as a “natural fertilizer” to farmers. Sewage sludge is loaded with toxic heavy metals, industrial chemicals, pesticides, herbicides, insecticides, jet fuel, and even nuclear radiation. The birth control pill is also a big contaminant of sewage sludge. Sewage sludge is literally dumped over the soil in which food grows and the plants uptake many of the chemicals found in sewage sludge. Besides avoiding genetically modified foods and pesticides, this is another reason why you should buy organic. I definitely recommend that you avoiding take ALL oral and hormonal contraceptives as they are extremely dangerous. 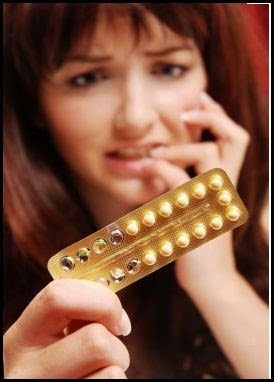 If you are pregnant or trying to get pregnant, you should also avoid taking the pill too. The pill is not the only synthetic estrogen that causes multi-generational health problems. Bisphenol-A or BPA is another chemical that has been show to cause multi-generational health problems and is chemically similar to the harmful estrogenic drug, DES. Most likely, it will cause multi-generational breast cancer too. To learn how to avoid these estrogenic chemicals which cause early puberty, PCOS, obesity, infertility, fibroids, endometriosis, and breast, uterine, and ovarian cancer, be sure to purchase my highly informative and awesome recording, Harmed By Hormones: How Estrogenic Chemicals Harm's Women Health.